4759 South Congress Avenue, Lake Worth, FL, United States. This a 2 step process. John Prince Park requires the reservation is in the occupants name. Call (561) 582-7992 and reserve the site you prefer for a 25 ft trailer with 30/50 amp electric service. You may also book any other RV park in Palm Beach or Broward County. Next, you will book the reservation with me here. I will block the days you requested while you reserve with the park. Delivery Fee is based on 20 miles radius from Lake Worth. Additional fee outside of that area. Brand new 2018 Sunset Trail Travel Trailer. We will set up this beauty for you with all the comforts of home. Features all queen size bed with private quarters. Large bathroom with walk in shower and plenty of storage. Fully stocked kitchen with plates, dishes, silverware, pots, pans, cooking utensils. Outside kitchen area with refrigerator, grill, and sink. The dinette and couch both turn into beds. Pets considered on a case by case basis with additional deposit and cleaning fee. No smoking in the RV. Any trace of smoking will be a $500 cleaning fee. 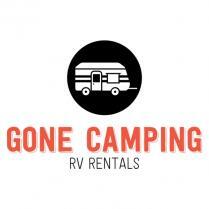 Gone Camping RV Rentals in Lake Worth.